When I first moved to Richmond, after completing a Master’s program in Communication, I saw myself working in the world of local business marketing. I even worked at a small Richmond company for one year. But, my career took a drastic shift in 2006, when I decided to join the campaign to fight the passage of Virginia’s “Marriage Amendment.” I love challenges and often champion underdogs. I also embrace having the sometimes difficult conversations that are important for making our communities better. So, when the campaign was ultimately (and predictably) unsuccessful in preventing the legislation, it was still very meaningful to me. It made Virginians think more positively about their LGBTQ+ neighbors and family, and I look back on it as one of the most important things I’ve done. With my first taste of what it felt like to be a change-agent, I wanted to do even more. I worked about three more years for Equality Virginia, continuing the work that the campaign started. Then, recognizing that there were so many more diverse challenges our Richmond community was facing, I joined the development team at United Way to participate in a broader-reaching level of community work. Since then, I’ve sat on the board of Diversity Richmond and Safe Harbor, and served as the Associate Director of Side by Side: a youth center for Central Virginia’s LGBTQ population. 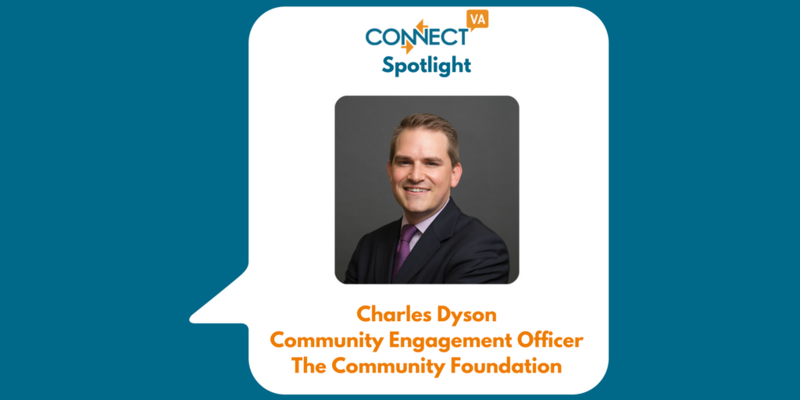 I currently serve as one of the Community Engagement Officers at The Community Foundation. My name is Charles Dyson and I thank you for taking the time to get to know me! My group at The Community Foundation (the Community Engagement team) manages the competitive grant process and works to provide nonprofits with resources and learning. What drew me to this position is how committed The Community Foundation is to being a “changemaker” and not just a “grantmaker.” To this end, we’re working hard to be an approachable team, a trusted advisor to our nonprofit partners, and to really leverage the resources we have to create sustained change. My specific role is managing the grantmaking process. That includes the processing of grants and their payments through The Foundation’s internal systems, but also includes things like grant review, making evaluations and reading agencies’ final reports when they provide grant outcomes to show our collective impact. As I’ve said, I love challenges, and there’s never a shortage of those in nonprofit work. I also love the wide breadth of experiences that a nonprofit professional automatically gets through wearing all of the hats we wear. I’ve been intentional in my career about seeking positions that give me a well-rounded perspective. I’ve managed a program, served on marketing teams, engaged in donor stewardship, sat on nonprofit boards, and done these in both small and large organizations. Finding solutions to larger community needs from the viewpoint of a funder, or leading the work of a direct-service agency affecting individuals’ lives, are both challenging. I’m passionate about working toward solutions at all those levels and love that I get to do that in my current role. Right now, my most exciting challenge has been being a new staff member at The Community Foundation during a really energetic time at the Foundation. The Community Foundation is going through a period of change. With any organization, especially one as established as The Community Foundation, there are periods where organizational leaders see an opportunity or need to recalibrate their work in order to deepen its impact. I’m very excited that The Community Foundation is in the middle of one of those stages right now. We have the ability to be more of a catalyst – bringing diverse partners together, collecting and sharing data and insights, and amplifying our voice around issues of importance. Part of the challenge has been planning how we will do this in new ways. But, as someone who loves the process of transformation, it’s also been extremely exciting to get to be a part of this. Do you have any interesting changes on the horizon? One of the bigger changes in my world has been how we’ve adjusted our competitive grants process. Starting January 8, The Community Foundation will open its 2018 grant cycle with a new team of Community Engagement officers. And, in an effort to make the process simpler for area nonprofits, we’ve moved to just one grant cycle per year (instead of two). So, 2018 applications to The Community Foundation will be accepted only from January 8 to February 15. Decisions will be made and communicated in early June. The process is also a one step process, where agencies only have to provide a proposal (no more preliminary applications, plus full proposals). As a former employee of a grantee organization, I’m very happy we were able to remove this extra hurdle for people! We’ve also refreshed the results frameworks of our focus areas, identifying strategies and activities that we believe will lead to long-term community change.